We continue reviewing motherboards based on the new AMD 800 chipsets. This time we have a solution based on the simplest chipset in terms of design, which doesn't have integrated graphics. Essentially, it only differs from AMD 770 by using the new Southbridges that support SATA 6Gbps. Note that choosing between SB850 and SB810 is up to the motherboard maker, and the difference between the two chipsets is that SB810 doesn't support RAID 5. Anyway, formally, the Northbridge is also new, because it has the twice as fast bridge interconnect (and that's the only difference). Since the number of PCIe lanes has remained the same, and since only one graphics slot is formally supported, the chipset can be referred to as classic. Such solutions used to be the bulk in due time, the foundation of all mainstream motherboards. Well, these days motherboard makers often try to add optional functionality so their products stand out in a crowd. In this case Biostar decided to install the second graphics slots, having allocated for it 4 PCIe lanes from the reserve. And it seems that the CrossFire mode isn't limited artificially, so if you can fit two graphics cards onto this motherboard, the driver settings should reflect that. Of course, that slot can hold any other expansion card that can live with 4 PCIe lanes. 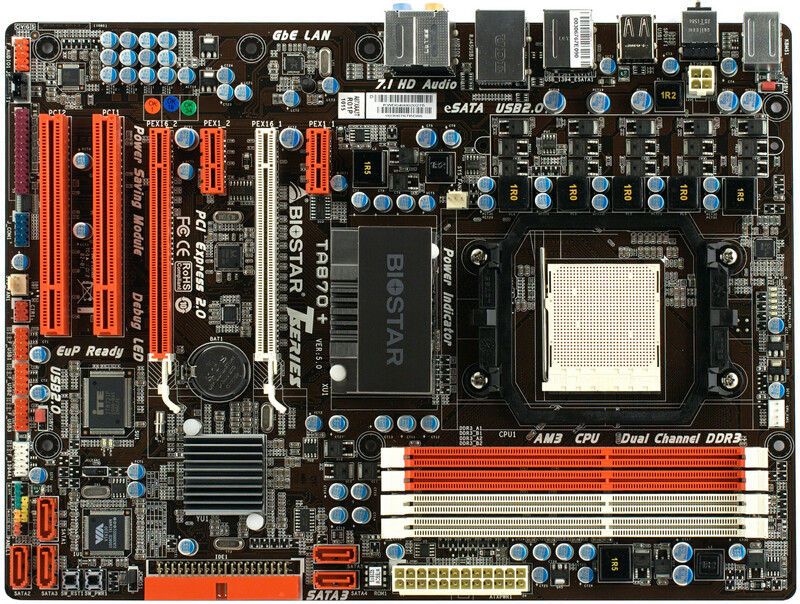 Even though the SATA connectors are vertical, two graphics cards should not prevent access to any interfaces on the motherboard. Only the power and reset buttons may theoretically be obstructed by a cooler cover. But since those two are an option, it would be strange to demand that they should always be accessible. Auxillary controllers onboard include just FireWire, so there's a 6-pin connector on the backpanel. It's very nice that one of the chipset SATA ports is output as eSATA, and that there are S/PDIF Out ports of both types. Traditionally, AMD chipsets, especially those without integrated graphics, need no special cooling, a couple of heatsinks is enough. So that's exactly what you can see on most motherboards, TA870+ included. If any serious overclocking is planned, VRM MOSFETs should be cooled by at least a heatsink. 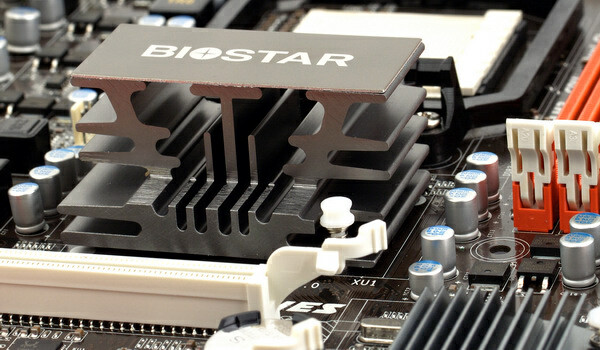 However, it seems like Biostar decided that redundant power circuitry should be enough for a mid-end motherboard. So while it won't overheat during moderate overclocking, it's not intended for records. The CPU VRM has 5 phases with 3 MOSFETs per each, which is good enough for a mid-end solution. There are 10 x 820µF and 5 x 270µF capacitors, all solid. This provides support for processors with the TDP of up to 140W inclusively, although most CPUs like that have already had their steppings changed and now have up to 125W TDP. The bundle includes 3 SATA cables, 1 SATA power adapter and a user's manual. The set of T-Series utilities includes a BIOS upgrade tool, as well as overclocking and Green Power management utilities. 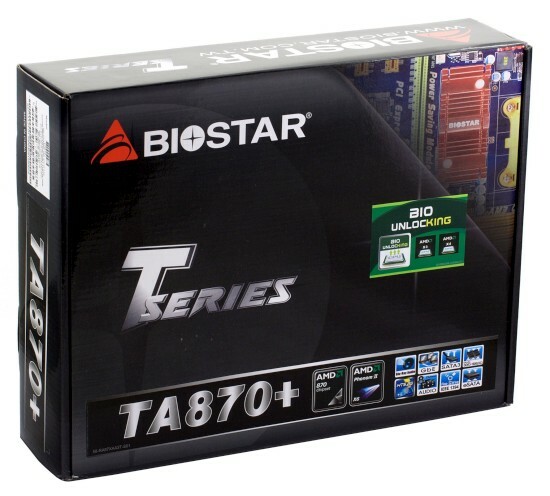 Biostar TA870+ is based on the AMD 870 chipset (AMD 870 Northbridge + SB850 Southbridge). It supports up to 16GB DDR3-800/1066/1333/1600, has 5 internal SATA 6Gbps ports (RAID 0, 1, 0+1, 5), and another one as eSATA on the backpanel. Auxillary controllers are listed below. Integrated audio based on the 7.1-channel Realtek ALC892 HDA codec. There are both optical and coaxial S/PDIF Out ports on the backpanel. FireWire based on VIA VT6330 (PCIex1) for 2 x IEEE1394a ports (one on the backpanel). PATA/133 based on VIA VT6330 (PCIex1) for 2 devices. Used instead of the chipset's native. System monitoring based on ITE IT8721F. Supports automatic CPU fan speed adjustment. The BIOS allows you to set temperature thresholds for starting and stopping the fan, a value according to which a minimal speed will be chosen, and a speed increment (lower means smoother adjustment). Both 3 and 4-pin fans are supported. Overall grade: good. Again the results are lower than expected for a motherboard with this codec. This is a traditional issue of Biostar motherboards which they haven't fixed yet. But they are trying, as we can see. In particular, not many motherboards feature such batteries of capacitors included into audio circuitry. But perhaps there's something more to the issue, so Biostar should try harder and, finally, fix it.